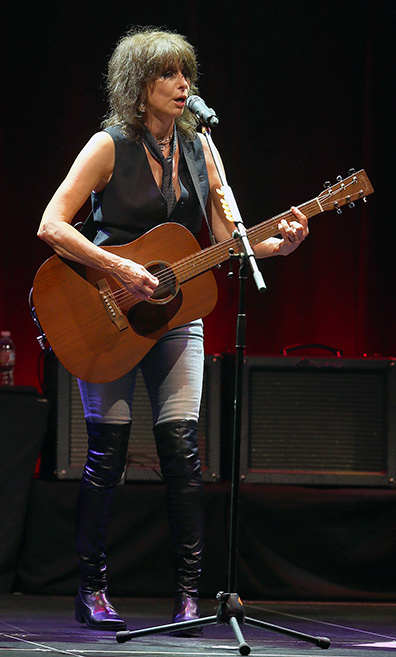 Like getting reacquainted and catching up with a best friend you haven’t seen in many years, Chrissie Hynde’s solo performance at the Masonic Tuesday night emphatically reminded everyone in attendance exactly how she earned her well deserved reputation as one of the true female pioneers of Rock ’N’ Roll and one of the best songwriters of her time. Not content to merely rest on her laurels of being the front woman of The Pretenders since 1978, Hynde is touring in support of her first solo album, “Stockholm”, a splendid effort from which she played eight cuts, most of which meshed nicely with the many vital older tracks she performed over the course of a 95 minute set. With a voice as strong as ever the gritty Hynde personalized her visit to the Bay Area by giving shout outs to local icons Neil Young and the late Bill Graham, as well as emphatically informing the crowd that she “only works with men” as she introduced her tight four man all British backing band. Clad in knee high leather boots the 2005 inductee to The Rock and Roll Hall of Fame proceeded to turn back the clock. still managed to deliver a set that had the near sold out crowd on their feet for a majority of the evening. The recently renovated Masonic offered drastically improved lighting and sight lines along with stellar acoustics that helped bring long time fan favorites like the jangly ‘Don’t Get Me Wrong’ and ‘Back On The Chain Gang’ to life at a high energy level near the conclusion of the regular set. Returning to the stage with ‘I Go To Sleep’, a ballad originally written in 1965 by Hynde’s one-time lover Ray Davies of The Kinks before being released as the FIFTH single from “Pretenders II” in 1981, Hynde quickly followed by amping up the intensity to it’s highest level of the evening with ‘Precious’ and ‘Tattooed Love Boys’ before seemingly closing with ‘Dark Sunglasses’, the catchy lead single from the solid “Stockholm”. Considering her volume of work and at least a handful of iconic Pretenders tunes that went unplayed, it could easily be argued that either a longer show, or a more selective playlist was in order. But this was advertised as Chrissie Hynde solo and she delivered with significant room to spare, even treating those remaining in the crowd to a completely unexpected rendition of the Christmas ballad ‘2000 Miles’, a song not on the original setlist that concluded the gig and helped to remind everyone that December’s holiday season had officially arrived.